So we just finished our first GeoTour, and I know there are others in our area, but when I look at the GOETOURS Map there are only 7 in all of Canada! I am in Edmonton Alberta Canada. Does anyone else have issues with this map/feature? I can't even find the geotour map tonight! Map looks okay to me. I see 7 Canadian GeoTours on the map and in the list of all GeoTours below. Quote, "I know there are others in our area", area being Edmonton. How do you know that? I speculate that if there have been other GeoTours in the past, they've expired. A geotour must be renewed annually. Possibly you're confusing official GeoTours with other reward geotrails that do not have the GeoTour designation? 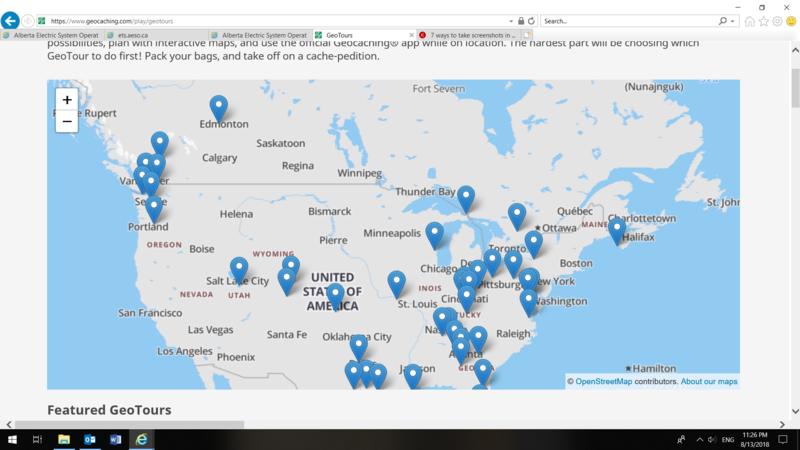 In any case, there are currently 7 official GeoTours in Canada, so you're map is working correctly. Other non-GeoTour reward geotrails are included in the map/list linked in this forum. It must have been because I was using the site on my Kindle. When I use the desktop I see the map just fine! I was looking at GC6HGZH RVA Beachcombers, but after I posted this question they cancelled the geotour and made a post in the comments log. Suprising there are only 7 in Canada, but if the fees are high then I guess in a short run time you would get the active cacheers in your area in a short time anyway. Thanks for the replies, I honestly thought my map was messed up and there were more.